Is there anything that goes hand-in-hand like live music and summertime? Aware that the answer is a big "N-O", the folks at our favorite Tennessee Whiskey company, George Dickel, recently launched a new concert series at their Cascade Hollow distillery in Tullahoma. 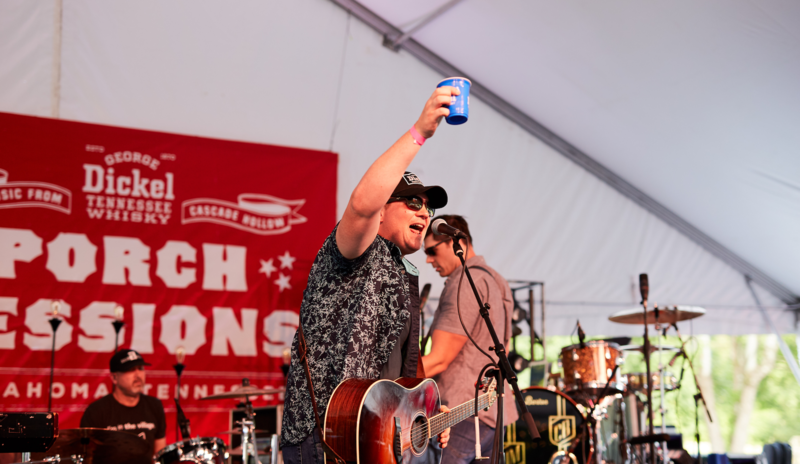 In addition to hosting some of the biggest names in country music, George Dickel's Porch Sessions (yes, the shows take place on the iconic distillery's actual porch) enlist the rising stars turning the music industry upside down. Kicking off the 2018 Porch Session season on May 19 was Warner Music Nashville signee, Ashley McBryde, who performed songs off her sophomore album, Girl Going Nowhere for the country music aficionados in the crowd. Opening the show was Striking Matches, a duo hailing from Nashville, who we've been obsessed with since their breakout track "When The Right One Comes Along" dropped in 2015. On June 2, the second Porch Sessions featured performances from two of our favorite artists right now, singers Adam Craig and Chase Bryant. Throughout the show, both performers could be seen cheersing concert-goers, raising their glass to the beautiful day at Cascade Hollow. Oh, and did we mention that they had a Hot Dickel bar onsite? Two words—yes, please. The next artist set to take the stage at Cascade Hollow? East Texas native, Paul Cauthen. Expect to be blessed with live renditions of tracks off his 2018 EP, Have Mercy, after six-piece, The Texas Gentlemen, warm up the crowd. Don't miss out on Cauthen's show on June 23, then make sure to keep your eyes peeled to see who will be gracing Cascade Hollow throughout August!